CM Magazine Profile: Eric Walters. Born March 3, 1957, in Toronto, Eric spent his childhood and adolescence in that city's west end "where the majority of the people I grew up with ended up in jail or in troubled spots. I think the reality is that life is not necessarily a bowl of cherries for people. I believe two themes run through my stories. One is a sense of belonging - people want to belong somewhere. The second theme is that, whether you're female or male, you have some power to make changes in your life. Life does not have to just 'do to you.' You can make a decision that you're going to do things for yourself and overcome. There's nothing more wonderful than overcoming adversity, to stare it in the eyes and to win. We don't have to be victims. One of the societal trends I see is looking for someone to blame for what's gone wrong for you. You've got to take responsibility for things. Rather than finding an excuse to fail, find a reason to succeed." "Going through school, I wanted to be a psychologist. I got an honours degree in psychology in 1979 from York University and started working as a social worker. I took both my Bachelor's and Master's of Social Work via part-time studies. When I was about 10 to 15-years-old, I thought teaching would be a good thing, but, when I was going through school, I realized that there was absolutely no way I was going to become a teacher with the market the way it was. Then, when things opened up, I thought, 'I'm going to go back and do this' because it still appealed to me. I got my Bachelor of Education from the University of Toronto while I worked full-time as a social worker in the evenings." While Eric has been teaching kindergarten to grade six full-time for some 10 years, he still maintains his social work connection. "I work evenings and weekends half-time in the emergency department of Credit Valley Hospital where I do such things as death and grief counselling, psychiatric evaluations, suicide assessments, work with victims of child abuse, domestic assault, any form of violence, breakdowns, anything." Asked to explain how he manages both jobs plus writing, Eric replies, "There's that old saying about 'change being as good as a rest.' It's true. Teaching and social work are such different jobs, and each gives such perspective on the other one. I really like both of them tremendously." "In my life, what I've often found are people continually saying, 'You're going to burn yourself out.' I've been working full-time basically since grade 11. I've always had a full-time job on top of going to school. I did my BSW part-time while working full-time, and I got two years of credits in two years and two months. The Social Work faculty kept saying, 'You can't do this. We won't let you,' and I'd respond, 'Well, that's fine, but shouldn't I be the one to determine what the limits are of my energy?' It's like someone saying, 'I'm cold. You should wear a sweater.' Some people have a lot more energy than me, and some people have less, but shouldn't it be my decision how much energy I want to devote? I like doing things and to keep moving. If someone says you can't do something, it almost gives you incentive to go harder. An editor sent me a rejection that basically said, 'We don't want your book, we don't think you should write, and we don't think you should live,' and then added at the end, 'Perhaps I'm being a trifle bit bitchy.' I kept that letter because people like that are a wonderful motivation to go on in life." "My first book, Stand Your Ground, was written, as are almost all my books, for the class I was teaching at the time. I do two or three books a year in class. I change with the units. We were doing a local studies unit, and I needed a local book. Because I didn't happen to have a Streetsville book, I wrote one set in the school, Vista Heights, and a number of the book's characters are kids I was teaching. Occasionally, you have these wonderful little things that intersect. I was doing a school presentation, and a teacher said, 'You probably don't remember me, but maybe you recall my son, Scott. He was in your class when you wrote Stand Your Ground. He hated reading until you started that book, and now he's in his OAC year." "Stand Your Ground was actually written backwards. I wrote the last chapter and wrote backwards for the class which certainly confused them I think. One of the kids, a big kid named Mike who's actually the character in Stranded, said, 'You know, Mr. Walters. I was looking at all the garbage in the library, and your book isn't half as much garbage as theirs." A typical Mike compliment! He added, 'Send it off,' and so I did. I got The Canadian Writers' Marketplace and just mass submitted. I think I had five rejections before getting lucky with an editor, Elsha Leventis, who liked it." "I've been so fortunate with editors. I've never met one who didn't make such a positive impact on a book through the changes they suggest. Sometimes I almost feel guilty because it's my name on the spine, but at least 25 percent of what evolves in the book is from the editor. When talking to classes, I describe the process - the 350 changes the editor wants and the back and forth. I'm never happy when editors suggest changes. My initial response is annoyance because it's written and I'm through with it. That book really doesn't interest me nearly as much as the one I'm writing now, and I've got to leave it to come back to make these changes. But the changes are always good, and the products are always right. Intellectually I know that, but emotionally I'm going back over a path I've already gone, and so I never like that initially." "I've been told some writers love that revision process. Not me. I love the first draft. Sitting down and just writing it is having fun. Usually I have an idea where the book's going to go, but the characters continually shock me. They'll say things or start off in a direction, and I'll have no idea that they're going to do that. For me, it's almost like, 'Why are you saying that?' If you have an idea of where you want it to go, you sometimes try and grab the characters and pull them back in that direction, but it usually isn't right. Usually they know where they're supposed to go. That sounds psychotic, but I swear that, if I opened my laptop up slowly enough and peeked underneath, the characters would already be talking." Most of Eric's central characters are 14. "It just seems to be that cusp age between childhood and adult. I'm going a little bit lower age-wise with some recent novels. In Tiger by the Tail, my main character is 13 while in Three-on-Three, a basketball book, the main character is 10. I'm trying to go down a little bit farther just to amuse myself, but I think 14 is such an incredible age. My oldest daughter, Christina, has recently turned 14. That's her on the cover of Trapped in Ice, and when you read about Christina in Stranded that's also her. I wanted her personality. I hate helpless female characters with a passion." "Because I have very little perspective of being a 14-year-old female, I started writing as male characters. When I began my fourth book, the kids in my class who'd read the first three said, 'Why are you always writing males as leads? Are males more important, more adventurous?' The answer, I realized, was that I was buying into what I'd read and I hadn't thought it through. Consequently, the next three characters I wrote were female leads. I want my females to be strong. In Trapped in Ice Helen has evolved from a very bookish, letting-the-world-act-upon- her type person, to someone saying, 'I can take command of this.' I like females to take command of the situation, and that's why I try to get those strong characters like Summer in Diamonds and Christina in Stranded. I want them to take control of their lives, and I want little girls to realize that they're powerful and not ever to take a backseat to anybody." 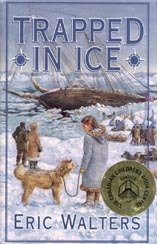 Trapped in Ice was another book which came out of Eric's classroom work. "One of the things I do when I go to schools is ask, 'Who can tell me the name of the first Canadian Prime Minister?' and usually it's one person per class. Because I found that Canadian heroes were being ignored, we did a whole Canadian focus at school where we painted a giant scale map of Canada and learned the provinces. Our speeches were on Canadian heroes, and announcements every day were about Canada. I took 10 Canadians and made them into short fictionalized stories. Robert Bartlett was one, and I just loved this guy. He was a hero, but, again, what I don't want is just someone who is heroic and a jerk. I want someone with integrity, and Bartlett was a man of extreme integrity - well read and well spoken. Bartlett's the sort of person I'd like Canadians to look up to. We don't have heroes. Wayne Gretzky's a fine fellow, but he's a hockey player, not a hero." "While researching Trapped in Ice, I found Robert Bartlett's nephew, a retired Supreme Court judge. When I sent him the manuscript, one of the things he objected to was that I'd given his uncle an accent. 'But Bartlett's from Newfoundland, an outport community,' I said. 'You mean he doesn't have an accent?' 'No,' the nephew replied. 'Well,' I said. 'I have one. It's a Toronto accent, and I'm not giving Bartlett my Toronto accent. He's having a 'down east' one." Eric's research on Bartlett began in an odd way. "I found a historical book on him in the discard bin of the library when I had my class there. It cost me fifty cents, and so that was my primary research. When you've got somebody as wonderful as Bartlett, you just have to take the pieces that have been given you and craft around them. That whole episode involving the ship's sinking and his playing the funeral march on the phonograph, who could ever think of that? That's beyond creativity. It was wonderful. I wanted to write the novel almost just for that scene. Then I did peripheral research. I found out about polar bears from a doctor who spends her summers in the Arctic, and I went outside without my coat on and experienced bad storms and just felt what it was like." "I like doing things experientially. Actually, research is incredible fun. For Diamonds in the Rough, I went into a rather nasty biker bar in downtown Toronto, sat there with my pen and paper and ordered a coke. Five bikers came over to my table and demanded to know I was doing. As one of them threw my pad on the floor, I start explaining. He picked up my paper, brushed it off and said, 'We can tell you some stories.' I love when people tell me stories." Stories also became part of the research for War of the Eagles. "Besides getting information from my father, I phoned the Chamber of Commerce in Prince Rupert and said, 'Can you give me the names and phone numbers of some people who were in Prince Rupert in 1941?' Using that information, I called people and said, 'My name's Eric Walters. You don't me, but I write children's novels. Could you tell me a story about being in Prince Rupert in 1941?' When I tell kids this during presentations, they say, 'They hung up on you, didn't they?' No, they told me stories, wonderfully touching, loving, disturbing stories. And that's why I do a lot of the research - I love interviewing people." 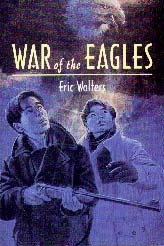 While the stories people told didn't find their way directly into War of the Eagles, Eric says that a number contributed to emotions found in the book. "The closeness between the two characters, Jed and Tadashi, is one example. A woman told me about her best friend, a Canadian of Japanese descent, who was being shipped out. The woman, only learning about her friend's leaving on that day, ran to the train station where they talked and talked. Just as the train was leaving, the woman pulled off the necklace and locket her grandmother had given her and passed it up to her friend. The train went away, and she never saw her friend again. As she told me the story of what had happened 50 years before, she began crying, and I started crying too. And so that emotional integrity was there in the book in terms of the boys' friendship." "In another instance, I was talking to someone who said, 'You know what? Them Japs got what they deserved.' It was like getting hit in the side of the head with a shovel. I didn't even know what to say. I should have asked, 'Was your brother killed? Was your father in Hong Kong?' But I just couldn't. At that point, I was just so shocked by the anger that's still part of their memories. And so I used the anger at the use of that word in the scene where Jed confronts the looters." "Parts of War of the Eagles are directly from my father's story. There's a family picture of my father holding a dead eagle in 1943 in Prince Rupert. When I was 11, I saw this picture and asked him to tell me the story. Thirty years later, it inspired the novel. The soldiers were always killing eagles, and they actually threw a live eagle, the base mascot, into the showers. In school visits, I talk to kids about using family histories and show them a blow-up of the picture. My job is to teach something about creative writing and story development, how you develop a character or where stories come from - newspaper articles, family histories. I love going in and doing some teaching, and the feedback I get is that the kids want to read my books. More importantly, they want to write, and that means much more." "When I'm doing these presentations, I also talk about character development and we develop a character. Then I'll ask, 'Do you want me to juggle?' I take a bean bag and throw it up in the air. No one's too impressed. I take a second so that I'm juggling two, and they're a little more impressed. Then I do three and say, 'Now I'm really going to show you something.' I grab a bunch of things and walk over and stand so that I'm over top part of the audience. 'Now, I'm going to juggle,' I say, and those underneath me panic. I point out that I know some people who maybe can do this, but I can't. Three's my limit, and, in a book, that's about all I can ever juggle - a main character and two secondary. There's room for three, and, beyond that, they're more peripheral." 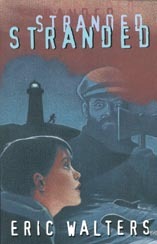 Stranded is quite different from Eric's other books, and he acknowledges that the difference was very deliberate. "I don't like writing the same thing twice. Even if my characters have similarities, I like to try a new departure. I wanted to try the time line which I never had done. I also wanted a spooky story, and so I threw in the ghost story. Actually, another book I have coming out in the fall of 1999 is called Visions, and, for it, I took really eerie, spooky, scary Inuit fables and wrapped them around the story. I know you're not supposed to say bad things about other authors, but 'Goosebumps' drive me crazy. Kids get into the continual loop of them. I want genuine scary. Actually, William Bell's Five Days of the Ghost is my 'Goosebumps' antidote. I'd read a 'Goosebumps' to the class, and we'd quickly analyze it. Then I'd read Five Days, and we'd critically analyze that. And the kids would say, 'Five Days is scary; that's garbage.'" How Eric begins a book seems to vary with each book. "Sometimes, as with War of the Eagles, I have an idea and write from that idea. I had a little bit of a story, and I went from there. With Trapped in Ice, I had the bare bones of an entire story just waiting to be fleshed out. In the case of Stranded, I asked the kids in my class to bring in newspaper clippings about whales because we were going to do a whale unit and I didn't have a story to write for them. Someone brought in a clipping about stranded pilot whales, and the book just evolved from there. For instance, I sent two kids out to the parking lot and said, 'Count the number of cars.' They came back with the answer, 'Twenty-four.' I said, 'Well, there's 24 stranded whales.' Then I said, 'Go out and see if all the cars are the same size.' 'Why?' they asked. 'Big cars will be males; little cars will be babies; and medium size cars will be females.' So Stranded evolved from there. With some stories, I just have a character who interests me, and I let the characters talk, and they sort of sort out what the plot is going to be. I didn't have much idea at all when I began STARS. I just thought, 'Car theft ring, get caught, get sent up north,' and then the characters evolved. I try not to take rejection too personally, but Joseph, the central character, is so near to my heart I would have taken that one very personally if it had been rejected by publishers. STARS was actually the first time I ever tried to write a novel away from school. I sat down during my daughter's nap time one summer and wrote for an hour and a half a day for 31 days to get STARS." "I try and write every day. I can write almost anywhere. I was joking with one writer because she talked about where she writes, the perfect setting, and I write at the food court at Bramelea City Centre if that's where I am for lunch. If it's a long traffic light, I'll open my computer. Basically I'm always evolving stories and ideas, and I don't need much time. At the hospital, I'll see a patient, and, while I wait for the doctor I need to confer with, I'll open the computer and write a paragraph and a half, close it back up, and talk to the doctor. I always write on the computer. I cannot write paper and pencil anymore. I can't edit on computers to save my life though. I have to write on the computer and edit on hard copy. When it's on a computer screen, it looks perfect." Unlike many authors, Eric has a variety of publishers. He explains, "Publishers publish very slowly, and I've written seventeen novels and one picturebook since 1993. Publishers have a pace they want to work at, and I have a pace I want to work at. I don't like waiting for anything so I go after publishers. At one point, I had an agent, but that didn't work so I became my own agent, and then I had success. For example, I met Marie Campbell of HarperCollins at the Silver Birch lunch, and two weeks later I called her and asked, 'Would you like to see a novel?' At this point, I think the agreement is that Penguin will have first crack at historical fiction, unless it's related to Eagles because there'll be a sequel, Caged Eagles, in the fall of 2000. HarperCollins has been very good with the contemporary stuff. Orca has been wonderful as well. These are nice people, and they've been saying, 'You've really got to be selective." And I don't want to compete with myself." An example of how Eric does not compete with himself can be seen in two of his 1999 books which, although their age audiences overlap, are from different genres. "Tiger by the Tail has a female character. It's about a couple of kids who wander into an old deserted farm. They go into the stable area to get away from a storm and are confronted by a tiger in the stable's basement. It turns out that an old man who retired from the carnival has brought with him his exotic animals - a cheetah that's too old to move, a monkey that drinks Coke from the fridge, a parrot that only says nasty things to people, and the tiger that got loose when local teenagers let it go. The kids have to help the old man bring the tiger back." 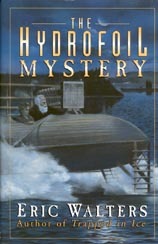 "The Hydrofoil Mystery is historical fiction featuring Alexander Graham Bell. It's set in Baddeck, Nova Scotia, in 1917. Researching Alexander Graham Bell was one of the most enjoyable things I've done in terms of writing or reading in years. I'm delighted that people are going to have a chance to see this guy because he was a genius, a word that gets so misused. There was da Vinci, then there was Bell, and there's nobody else who's on that level. But beyond being a genius, Bell was a devoted husband, wonderful father, and incredible grandfather. Kids have to know about these sorts of role models. It was the most playful novel I've ever written because it's a mystery. I really had fun with it. I've got to give Eric Wilson credit for his suggestions and information. I really like mysteries, but I'd never written one." The Hydrofoil Mystery was inspired by my daughter Christina. While holidaying in Baddeck, Nova Scotia, we were sitting in the hydrofoil gallery, and Christina did what she always does - she said, 'So what story would you write about here?' I replied, 'Well, maybe I'd ....' and, before we left, I had the story outline. Then I ran and found paper and started writing the outline down. Bell was a great guy, right down to his sense of humour. He loved playing practical jokes. He had a big stuffed bear that he used to leave in places for people to stumble into. Sometimes he'd put it on the road in front of his estate, and he'd hide in the bushes and watch people's reactions as they came by. I included a scene like that, but I didn't have to think it up. This was Bell." Fall of 1999 will see the publication of Three-on-Three, "a basketball story set in Clark Boulevard Public School. I was running a three-on-three basketball contest and was writing on demand. I had to keep one chapter ahead of the kids. Appearing the fall after that will be The Magic of Oak Island which is set off the east coast. I did my research for the Oak Island book via the internet. I have a central character who's a magician, and he takes the typical magician approach that, if everyone has been focusing on the pit, then it's not there because that's not how magic works. If you're focusing there, it's because things are really here, and so he does this triangulation and figures where the 'treasure' really is. I'm now reading that that's what they think the situation is - the money pit is the fake part. There's something somewhere else, and they've started digging at the other end of the island." Asked if he was familiar with Joan Clark's The Hand of Robin Squires, which posits one explanation for the "treasure pit," Eric replies, "If somebody's written something about what I'm writing, I try to avoid it if I can." But Eric does admit reading Budge Wilson's Sharla "because I'm writing a novel with Churchill, Manitoba, and polar bears. I read Sharla, and I'm OK because I took an entirely different tack. The novel's about this kid, Kevin Spreekmeester, who enters a capture-Mississauga photo contest and wins. The prize is a trip to Churchill and the opportunity to work with a world famous National Geographic photographer. Now, I have a friend by the name of Kevin Spreekmeester who lives across the street, who entered a capture- Mississauga photo contest, and who won a trip to Churchill, Manitoba, to photograph bears with.... When Kevin told me his story, I thought, 'This is a novel.' So now Kevin's 13 again and has his hair back. He's just happy that Spreekmeester's going to be in print." "I also have two novels coming out in the spring of 2000. One, from Stoddart, is called Rebound. It's about a kid who's in a wheel chair after being paralyzed in a car accident. The other, which Penguin's doing, is The Bully Boys, about the War of 1812. I'm using James Fitzgibbons as my main hero. I've got a 14-year-old who's there with Fitzgibbons witnessing what's happening. I'm going to try something completely different. My 14-year-old's going to kill somebody, and I'm going to have it happen in a very bloody, painful, moaning way where he's going to have to sit there and look at this person who's dying and that he's killed. He'll have to look him in the eyes, and this guy will say to him, 'Can you tell my wife? Can you tell my kids what happened to me, and can you give this to them?'" "I want to make the death vivid because I have this theory. Developmentally, little boys and little girls are born at the same level, and then little girls grow ahead faster, and boys catch up at about age 75. Boys really think that war is this fun game, and I want to make it vivid. I'm not going to let this be a gratuitous war book, and so my character is going to start off thinking that war's fun and have a 'Boy, I wish I could be there' attitude. I want this to hit hard in the end. Through my hospital work, I've been around gunshot wounds and knifings. It's just awful what you see. You've got to make violence the way violence really is, and not like cartoons and on TV." Diamonds in the Rough Eric dedicated "to all those teachers who spend their careers finding diamonds and making life less rough." Eric explains that "I've had so many good teachers. When STARS won the Silver Birch, I invited my grade five teacher to the luncheon because I wanted a chance to thank her in front of 1200 people for what she did in terms of inspiring me to write but also for just inspiring me period. Her name is Christina Gay. She's 73, retired on Toronto's Centre Island, travels the world and does volunteer work. She's incredibly special to me. She's still somebody I'm in contact with, and she's still inspirational. As I said, my Mom died when I was young, and I was raised by a single parent. There was a lot of poverty in my family, and Christina Gay was somebody who made me realize that there was something worthwhile in me. She was there at the right time. It's one of the things you hope for as a teacher. I had a university prof, Dorothy Herberg, who taught me incredible things, and during my B.Ed. placement period, I was fortunate to be with a gentleman named Larry Swartz. Even now, when I teach, I always think, 'What would Larry think of this?' I've been fortunate enough to have these people at many different stages of my life." Eric took the 1998-99 school year off from teaching and is anticipating doing the same for 1999- 2000. "The purpose is promotion. I'm aiming to talk to over 75,000 kids this year. In just one week, I did 20 one-hour presentations with 100 kids per presentation. I look at the wonderful writers who have not had great success, and I think the difference between success and lack of success is promotion more than it is skill. There's too many good people who don't get noticed. In the past three months, I've walked into more than 100 bookstores and said, 'Hello. My name's Eric Walters. Would you like me to sign my books, and then I can help you move them to the front?' Blatant self promotion seems to be the key. And you feel a little bit embarrassed because it's not the way you've been raised to do things, but I'm doing it." "I can't see doing anything full-time. What makes things interesting is the variation. If I won a million dollars, I don't know if I'd teach anymore, and I'd cut down the hospital shifts dramatically, but I'd still be writing because I only write what I enjoy." Diamonds in the Rough. Stoddart Kids, 1997. 0-7736-7470-5. Ages 10-14. The Hydrofoil Mystery. Viking, 1999. 0-670-88186-4. Ages 9-13. Stand Your Ground. Stoddart, 1994. 0-7736-7421-7. Ages 10-14. STARS. 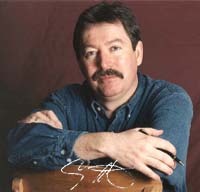 Stoddart, 1996. 0-7736-7447-0. Ages 10-14. Stranded. HarperCollins, 1998. 0-00-648100-8. Ages 9-13. Three on Three. Orca, 1999. 1-55143-170-X. Ages 7-10. Tiger by the Tail. Beach Holme, 1999. 0-88878-396-5. Ages 10-14. Trapped in Ice. Viking, 1997. 0-670-87542-2. Ages 9-14. War of the Eagles. Orca, 1998. 1-55143-118-1 (cl), 1-55143-099-1 (pbk). Ages 10-14. This article is based on an interview conducted in Mississauga, ON, on Sept. 26, 1998.